Several Great War battlefields were fought over once again in May and June 1940 when the German Blitzkrieg broke in the West and the Nazi war machine overwhelmed country after country ending with the Battle of France. Flanders became a battlefield once more when German troops engaged British units around the city in May 1940, as they pulled back to the coast and Dunkirk. During WW2 many German soldiers carried their own cameras off to war. Camera ownership was very high in Germany in the 1930s and many German soldiers had grown up with photography. During the conflict they took millions of images, often right on the ground where the fighting was taking place. 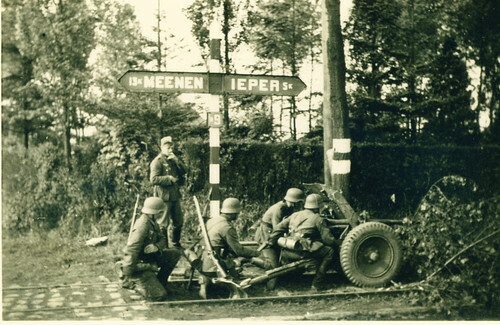 This photo shows a crew from a German Pak 36 anti-tank gun set up on the Menin Road in May 1940 at what during the Great War had been called ‘Clapham Junction‘. Beyond the hedge just behind the crew was ‘Stirling Castle’. Just over twenty years before this whole area had been a moonscape, resounding to the sound of shell-fire. 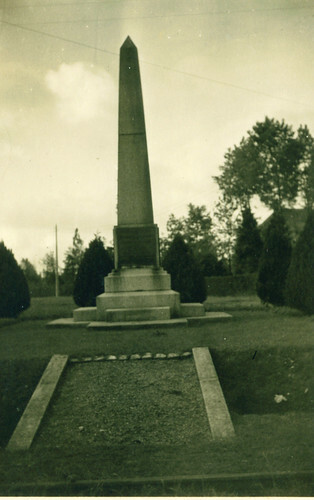 Once more guns roared on the Menin Road and one of the German crew had a minute to stop and photograph the 18th (Eastern) Division Memorial that was close to the same junction (below). This entry was posted on 22/10/2012 by sommecourt. It was filed under Aftermath, Battlefields, Flanders, Great War, War Memorial, Western Front, WW1, WW2, Ypres and was tagged with 1914-1918, 1940, Flanders, Menin Road, WW1, WW2, Ypres.